GENEVA, Switzerland -- The United Nations Children’s Fund warns up to 1.3 million people in battle-scarred areas of eastern Ukraine are facing a serious water crisis. 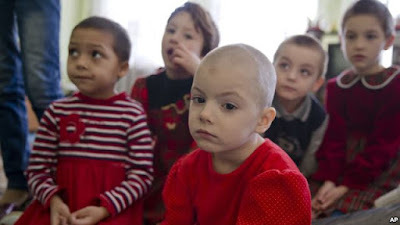 Lyuba, center, wearing a red outfit, sits along with other girls in a children's home in Khartsyzk, Ukraine. UNICEF reports ongoing fighting between government forces and pro-Russian separatists are damaging or destroying water lines, leading to acute water shortages. UNICEF says more than 470,000 people in rebel-controlled areas of the Luhansk region also lack a good water supply. This, it says, is forcing many families to travel to neighboring villages to get water from functioning wells. UNICEF’s Regional Chief of Emergency for Central and Eastern Europe and CIS, Robert McCarthy, just returned from a 10-day mission in eastern Ukraine. One of his stops was in the port-city of Mariupol, which currently is under government control. McCarthy says it is blisteringly hot in Mariupol, heightening the risk of water-borne disease. He says urgent measures must be taken to improve the flow of water and the safe delivery of water to the population. McCarthy says it is difficult to move across the line of control between government and non-government areas to deliver water, medicine and other essential relief supplies. He would not respond directly when VOA asked him if rebel forces were actively preventing the delivery of aid to Mariupol. “I would not comment on that, but just highlight that as I said, we have only had one primary corridor in recent weeks that we have been able to use to cross," he said. UNICEF reports almost 1.4 million people, including at least 174,000 children have been internally displaced since fighting erupted in eastern Ukraine in April 2014. It says the humanitarian crisis in the country is affecting more than five million people, including 1.7 million children, who are among the most vulnerable.